A cargo plane crash near the Iranian capital, Tehran, has killed 15 people, Iran’s army says. The Boeing 707 came off the runway and hit a residential area while trying to land at Fath airport in Karaj, 40km (25 miles) west of Tehran, in poor weather. 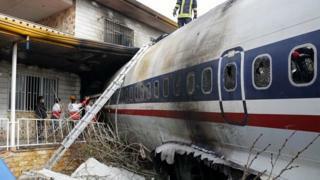 Only a flight engineer of the 16 people on board was found alive, with no-one reportedly killed on the ground. The plane’s “black box” voice recorder has been found at the crash site, local media reported. Fath airport belongs to Iran’s elite Revolutionary Guards Corps, and is located in the central Iranian province of Alborz. The cargo aircraft was transporting meat from the Kyrgyz capital, Bishkek. Its wreckage was found smouldering among houses in a residential area between Fath and another airport, Payam International Airport. Local media report that the houses were empty at the time of the crash. This is the latest in a series of Iranian plane crashes in recent years. In February last year, Iran’s Aseman Airlines was ordered to ground its fleet of ATR planes after one of them crashed into the Zagros mountains. All 66 people on board died. Years of tough US sanctions have prevented officials from purchasing new planes and critical spare parts. A landmark 2015 deal between Tehran and Washington brought renewed hope that the situation would change – but this was dashed last May when the US pulled out, reinstating sanctions that had been lifted.